Understanding Architecture 3 Edition This widely acclaimed, beautifully illustrated survey of Western architecture is now fully revised throughout, including essays on non-Western traditions. 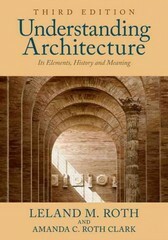 The expanded book vividly examines the structure, function, history, and meaning of architecture in ways that are both accessible and engaging.Significant features of the third edition include: Increased global coverage, with new essays on Africa, Japan, China, India, Islamic architecture, and the architecture of the Americas. A new chapter covering twenty-first century architecture. Updated coverage of sustainable and green architecture and its impact on design. Revised historical survey and expanded and illustrated timeline. Thoroughly revised and expanded art program, including more than 650 black and white images135 new to this edition, and more than 200 line art drawings created by author Leland Roth. A new 32-page, full color insert features more than 50 new color images. Understanding Architecture continues to be the only text in the field to examine architecture as a cultural phenomenon as well as an artistic and technological achievement with its straightforward, two-part structure: The Elements of Architecture and The History and Meaning of Architecture. Comprehensive and clearly written, Understanding Architecture is a classic survey of architecture.